In the interest of full disclosure, your correspondent must begin by declaring that for 17 years from about 1989 until a chainstay finally succumbed to fatigue, life on two wheels was spelled “Daccordi”. So, it was a high point of an afternoon of discovery at Bespoked to not only come upon a Daccordi stand lined with uncommonly desirable bicycles, but to find it manned by Ms Daccordi herself. The daughter of Luigi – and granddaughter of Giuseppe – Sena Daccordi, 35, is today driving a family business that self-evidently carries on its tradition of building very fine Italian racing frames but is also having to reinvent itself, for at least the second time. Whether Sena’s challenge is even greater than her father’s or grandfather’s is an interesting question, but when she says “times change” she must certainly appreciate the literally existential implications of economic and technological turmoil. As company lore has it, Giuseppe turned a passion into a business when he set up shop in 1937 – and then everything shut down for the war. 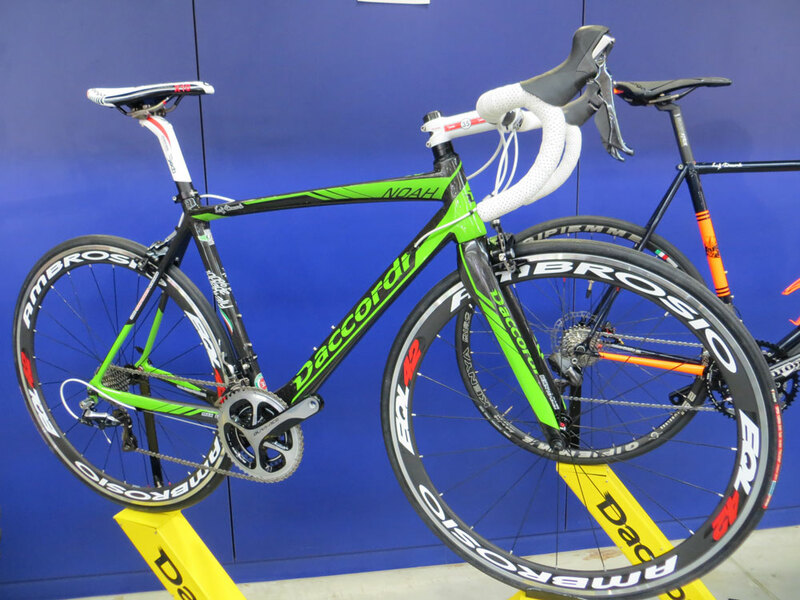 When business resumed, Daccordi’s shop in San Miniato Basso, near Pisa, focussed on top-quality racing frames. Luigi took over and carried on, achieving success as a supplier to Italian professional teams and a remarkable commercial reach for a small firm. Anecdotally, your correspondent can recall that Daccordi frames sold well from the Montrose bike shop in Glendale, California in the mid-1980s, and has it on good authority that Tony Mills’ Dauphin Sport shop at Boxhill, Surrey was taking about 10% of the firm’s output in the early- to mid-1990s, pointing to production at that time in the region of 4,000 frames yearly. 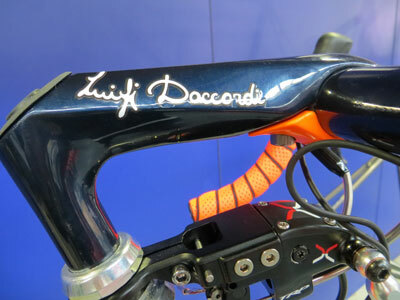 Retail insight suggests, however, that customers started to look elsewhere during the 2000s, when Daccordi was slow to adapt as aluminium and then carbon fibre shook up a market long dominated by steel. 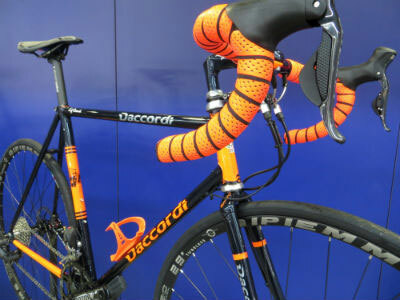 As the array of frames it showed at Bespoked demonstrates, Daccordi today is as good as any and better than most. But making beautiful bikes isn’t the same as selling them, and as Sena puts it, the past few years have been “very tough”. 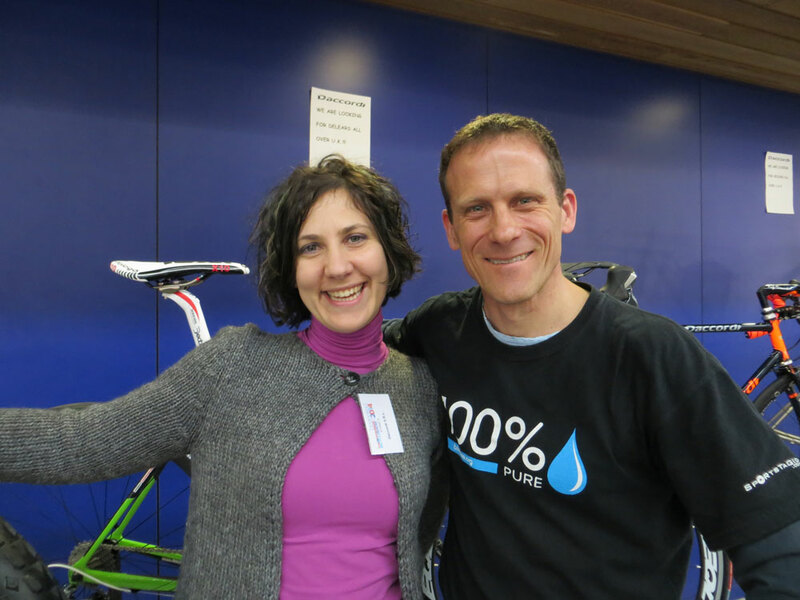 Today, she says, Daccordi is 10 people – including her mother and her boyfriend – making about 1,000 frames a year, all to order bar a few held by dealers for display, and also buying some in from suppliers. Fifteen years ago, the company was twice as many people. Bespoked 2014 was Daccordi’s first sortie to the UK in seven or eight years, and a sign on the stand calling for dealers summed up the situation; Sena says she’s picked up three or four UK dealers very recently, but is clearly starting from scratch in what had once been a major market outside of Italy. The company has been hit by two big changes in the business environment. One, of course, is the simple truth that times are tough in post-crisis Italy. The other is specific to a small bicycle manufacturer. Her parents’ marketing strategy was the traditional one, of supplying a professional team or two and riding the momentum of media exposure. But professional bicycle racing has become too big a business for a small company to support – a modern Pro Tour team demands two or three bikes for each of its 35 riders, plus spares. As Sena observes, the big companies that supply those teams spend much more on marketing than on product, so Daccordi hasn’t tried to run with that crowd since 2007, though it now supports second division teams. Unfortunately, she says, media exposure is concentrated on the Pro Tour, so Daccordi needs to take a different course if it is to connect with customers outside of Italy. The answer, she reckons, is the romantic attraction of Italy itself – specifically, Daccordi’s home region of Tuscany. Sena wants to join with other local companies to promote the connection between Tuscany and its unique products and appeal: Florence and Pisa, town and countryside, food and wine, bicycles.